Rainforest Cafe at Disney’s Animal Kingdom isn’t technically in the park, but it is certainly a welcome restaurant option while visiting Disney’s Animal Kingdom. 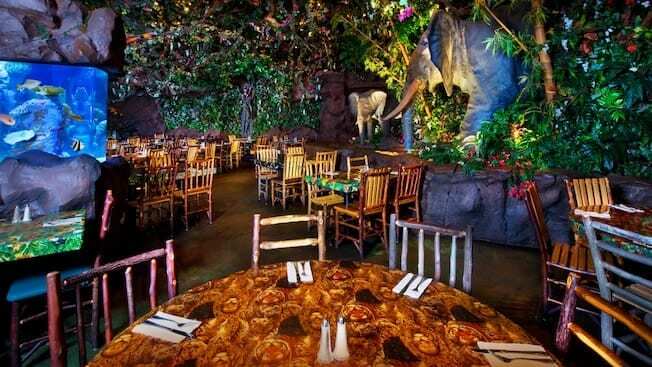 This restaurant offers the extensive Rainforest Cafe theming that can found throughout all the Rainforest Cafe restaurants. An aquarium separates the main seating area away from the merchandise area, and there will be periodic “meteor showers” that will affect the theming in the restaurant. The Rainforest Cafe also offers a secondary side entrance to Disney’s Animal Kingdom. A great way to enter the park after your meal, which helps you skip a lot of the crowds at the main entrance. Tusker House is a breakfast, lunch and dinner character buffet dining option located in the Africa section of Animal Kingdom. 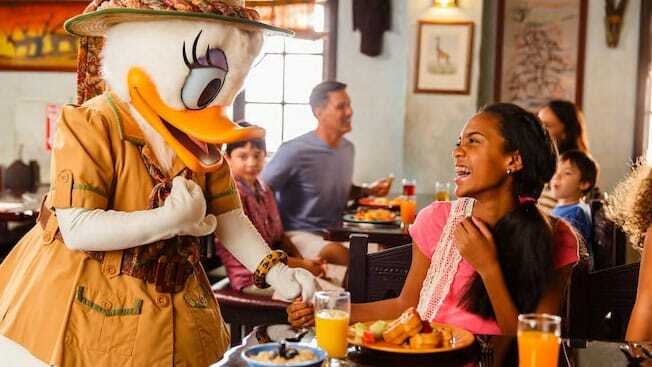 Guests will be able to meet Safari Donald and other classic Disney characters during their meal. Meals include options like Mickey waffles, banana bread pudding and beef bobotie for breakfast or whole salmon, curry chicken and roasted pork for lunch and dinner. The Tusker House also offers a Disney favorite drink, Jungle Juice, also known as POG. This non-alcoholic beverage is a combination of passion fruit, orange and guava juices. Prices are listed as $30 for breakfast, $35 for lunch and $42 for dinner, for adults. Nomad Lounge is a relatively new offering at Disney’s Animal Kingdom. 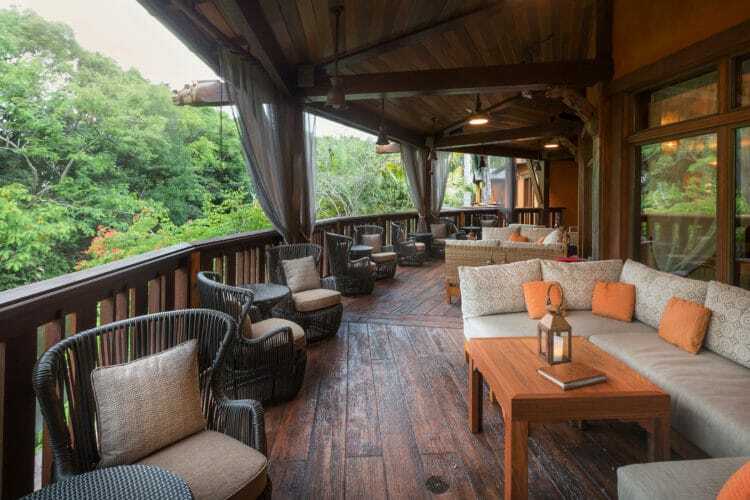 This relaxing lounge is located in the Discovery Island section, right next to the main bridge into Pandora: The World of Avatar. While the Nomad doesn’t offer full meals, it does present delectable appetizers like pork ribs, a house-made charcuterie board and a tuna poke bowl. The tantalizing offering though is the large assortment of unique cocktails, like the Tempting Tigress with its 10yr Reserve Bourbon, or the Snow Leopard Salvation with Snow Leopard Vodka, pear liqueur, lime juice and ginger beer. The Nomad Lounge is a rarely visited hideaway that offers adults a calming atmosphere to escape the sometimes frantic-speed of a Disney vacation. The shaded couches are also a great spot to catch a nice breeze for a quick snack break. Tiffins is a high-end eatery, connected to the Nomad Lounge, which offers very unique African, Asian and Latin dining options. Three different dining areas focus on countries in Asia and Africa, and the meal options are suited for an adventurous eater. Guests can order anything from charred octopus, to Kamo ramen or the whole-fried sustainable fish. The Tiffins Signature Bread Service appetizer offers a slew of different bread-style options with numerous toppings like romesco sauce or squid ink aïoli. 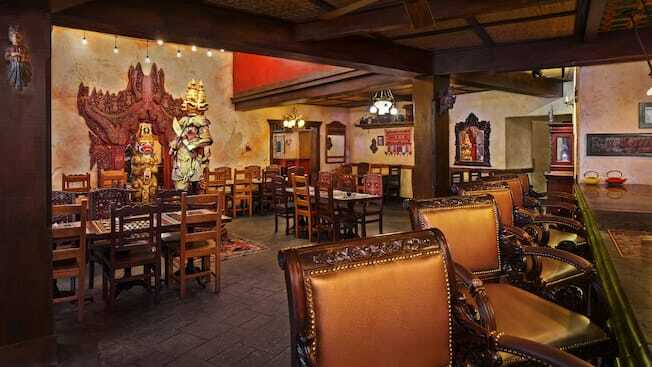 Tiffins’ theming is vastly different from other Disney restaurants because this restaurant is specifically themed around the creation of Disney’s Animal Kingdom. The walls are covered in artifacts that Imagineers sought inpsiration from during the creation of Disney’s Animal Kingdom. 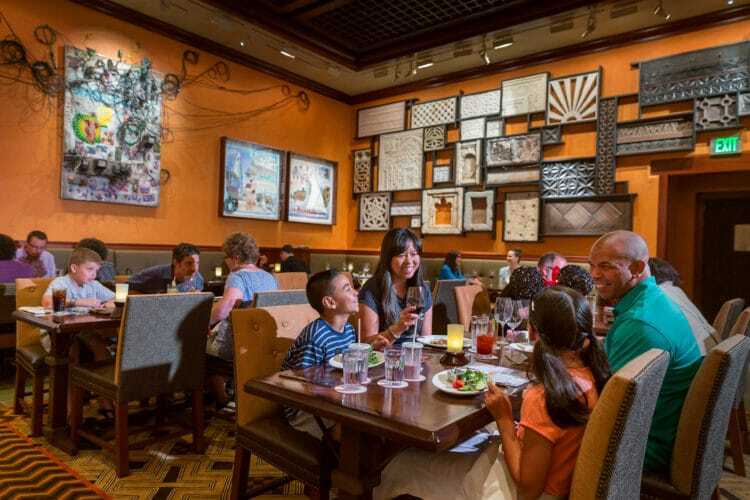 Fans of Imagineer Joe Rodhe will be able to find some of his handiwork, as well as photos of him and other Imagineers scattered throughout the restaurant. Yak & Yeti offers an assortment of pan-asian cuisine in the Asia section of the park. This restaurant is open for lunch and dinner, with meal options like lo mein, sriracha seafood mac & cheese, Bhaktapur Duck and coconut shrimp. There is also the offer to share larger appetizers like ahi tuna nachos or a dragon roll. Yak & Yeti also has a quick service location located right outside that offers egg rolls, a teriyaki beef bowl and honey chicken, as well as more traditional offerings like a cheeseburger or hot dog. 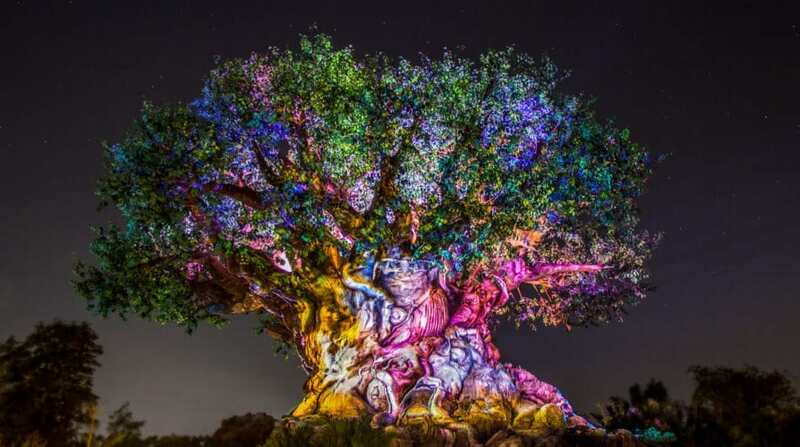 Our readers and viewers are some of the most knowledgeable theme park fans and experts out there, and thanks to their votes, we have our top five list of table service meals at Disney’s Animal Kingdom. Be sure to follow us on Facebook, Twitter, and Instagram to share your voice in our next poll. Check out our previous Theme Park Poll, Top 5 Table Service Restaurants at Disney’s Hollywood Studios, here.